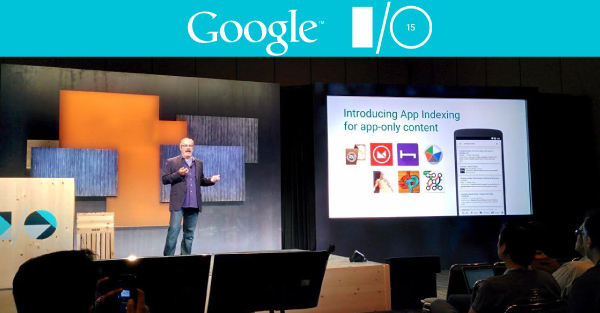 On Thursday, May 28, 2015, Chimani was touted by Scott Huffman, VP Engineering during the “Get your app into the Google index” developer session at Google I/O. Huffman highlighted Chimani’s Yosemite National Park app as an example of how mobile-first app publishers can integrate Google’s app indexing technology so their content is discovered during Google search queries. App indexing allows smartphone and tablet users to look for, find and open an app they’ve installed on their device through a traditional search engine like Google. Previously, online search results of a company produced little or none of their app content, leaving a significant void in exposure. Now, web publishers can link all aspects of a business’ online presence so the process is perfectly seamless for the user, and all encompassing for the provider. Companies with both a website and mobile app will be able to connect pages from a website directly to information found only on their apps. These changes will usher in a drastically different approach to how content is promoted and how companies develop their web strategies. For mobile-first developers such as Chimani, there is an added challenge because much of their content is not available on the web. To demonstrate how this problem can be solved, Chimani has been working with Google’s app index team to demonstrate how a mobile-first developer can leverage this technology and make their mobile-only content discoverable. Google I/O is a highly anticipated two-day conference that features very technical, in-depth speaking sessions focused on building web, mobile, and enterprise applications with Google and open web technologies. Tickets to the event sell out in minutes, however the event is watched by millions of people worldwide via live-stream during “Google I/O Extended” events. This week, Chimani also unveiled an impressive update for all of their apps for the upcoming outdoor recreation season with new features such as a completely revamped user interface, and an interactive badging system to record visits. New partnerships with one of the world’s most respected national park photographers, QT Luong, and National Parks Traveler, the number one source of national park related news, are also prominent additions.